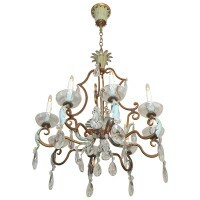 Outstanding French 1920s 8 arm cut crystal gilt iron chandelier with painted tole details, attributed to Masion Bagues. Beautiful cage form with a scroll work in the French Art Deco style. Great overall detailing and patina in the original finish. Chandelier uses 8-40 watt max candelabra base bulbs with more recent wiring and new sockets. Height of fixture is 31″ not including chain. Overall height can be adjusted to suit.